Ever since the first Art Style screenshot was leaked onto the internet, it seems Borderlands can't get itself out of the news. That's probably on purpose - and we aren't arguing. 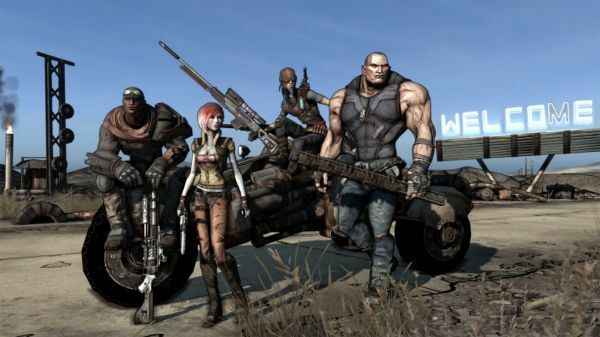 Shacknews sat down with Gearbox's Mikey Neumann, known as a guy who can get things, to talk about the upcoming four player co-op shooter. Some real gems are discussed, including the game's excellent showing at E3. Word of mouth brought it increased traffic as the show went on, and before long people were talking about what they saw. It wasn't just how great it looked in motion, no, part of it was the randomly generated mutant enemies. The most famous one, well it had baby arms. Shack: But dynamically-generated foes with baby arms? Have not seen that before. Mikey Neumann: It's funny, the band of psychos, the midget psychos, they take enough damage and you leave them alone, they actually try to kamikaze you. They pull a grenade off and run at you. When it's like, baby-armed dude holding a grenade and running at you, it's pretty much... it's gaming bliss, really. That certainly sounds strange. And while it might sound like a bug, well it's anything but. Speaking of which the game is just about feature complete, meaning Gearbox is busy squashing bugs for the game on all three platforms, getting it ready for certification. Even though the game has three months or so to go till its October release, this puts a lot of the staff in an idle state. Or does it? You see there's still plenty of work for artists and level designers to do when it comes to DLC. So while they can't change the core game, they can create new content which will be available later. This is where those "release week" DLC type scenarios come from. It's the ones the internet forum posters complain about - claiming it was simply content "cut" from the final game. I highly recommend reading that section of the interview concerning DLC, it's eye opening to hear it from a game studio's perspective. Finally with a three month waiting period, well, you would hope for a demo to get your hands a bit dirty before release. Sadly, it looks like that's not the case. Mikey Neumann: We talk about a demo every day. We would love to do a demo. There's obviously factors there. If and when we do one, I don't know if it'd be pre-launch or post-launch, because ...there's a lot of factors there. We would love to promise a demo, we can't quite yet, we just want to get the game done. That's always the hardest thing for developers to do--you never quite know how the time's going to work out. We're doing really well, but I can't promise it. I expect we'll be hearing a lot more about Borderlands for the next three months. Page created in 0.2336 seconds.